Following outline planning approval for 31 homes in 2015, we have submitted a Reserved Matters application which evolves the detailed design for the development ahead of construction works. From the outset this scheme has been to designed to reflect its location, enhance the setting of the listed farm house and ensure connections are maintained with the open countryside beyond. 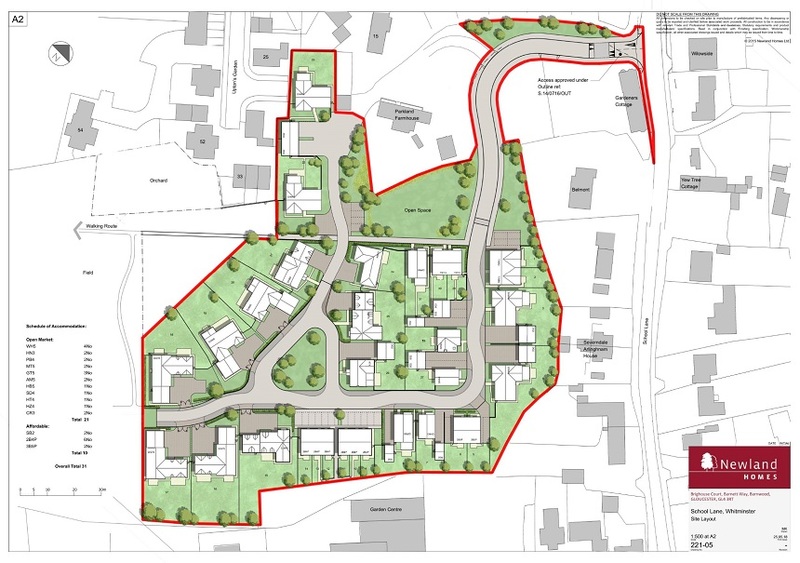 Proposed homes range from 1.5 to 2 storeys across the site with a small number of bungalows included which reflect the scale of houses throughout Whitminster. Houses have been designed to create a contemporary approach while referencing the agricultural nature of the site and wider area. By reflecting the local area and designing houses with generous proportions new houses will fit with their surroundings while maximising views and light suited to modern living. In addition to the large open green space, the development will offer an affordable housing provision and includes Section 106 contributions to the wider communiity in excess of £63,000.